On April 24, we observe World Meningitis Day. A study conducted by MeningitisNow.org revealed that ninety-five percent of people over age 55 don’t think they’re at risk for meningitis, because ‘everyone knows’ that meningitis is only a concern for babies, kids and teenagers. The truth is that anyone, at any age, can contract meningitis. 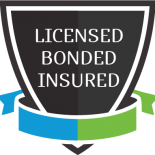 Approximately eighty percent of all cases occur in those over age 24, and the fatality rate is ten to fifteen percent. Seniors are more at risk than they might think, thanks to weaker immune systems, predisposing conditions, and drug interactions. In fact, caregivers in San Diego need to know the risk factors and symptoms of meningitis, because quick intervention and treatment is the best way to avoid serious complications from the disease. Meningitis can be bacterial, viral or fungal. In every case, the membranes that surround the brain and spinal cord, called the meninges, get inflamed and swell up. The most common cause of this inflammatory disease is either bacteria, a virus or a fungus, but meningitis can also be caused by chemical reactions and drug allergies. Non-infectious meningitis is a result of chemicals, medications, cancers or inflammatory diseases that cause the meninges to swell. Viral meningitis is the most common form of meningitis and it is usually not life-threatening. It is typically caused by enteroviruses in the United States, and generally clears up on its own. Other viruses with the potential to cause viral meningitis include herpes simplex virus, HIV, mumps, West Nile virus. Fungal meningitis is not common and is caused by organisms like fungi or Mycobacterium tuberculosis that invade the meninges. This develops into chronic meningitis, isn’t contagious to others, and often looks like a bad case of bacterial meningitis. It can also be fatal, if not treated quickly with anti-fungal medication. According to the CDC, bacterial meningitis in the United States is most often caused by “Streptococcus pneumoniae, Group B Streptococcus, Neisseria meningitidis, Haemophilus influenzae and Listeria monocytogenes”. Streptococcus pneumoniae (pneumococcus) causes pneumonia, ear infections and sinus infections. A weak or compromised immune system can let the infection travel to the membranes of the spine and brain. Listeria monocytogenes is found in contaminated food, and meningococcus is transmitted through coughing, sneezing and kissing. Some of the same bacteria can also cause septicemia. Seniors contract bacterial meningitis most commonly, because they encounter these bacteria and their immune systems aren’t always robust enough to protect them. Bacterial meningitis is serious – it can be fatal within a few hours and requires prompt treatment with antibiotics. How Are Seniors At Risk? 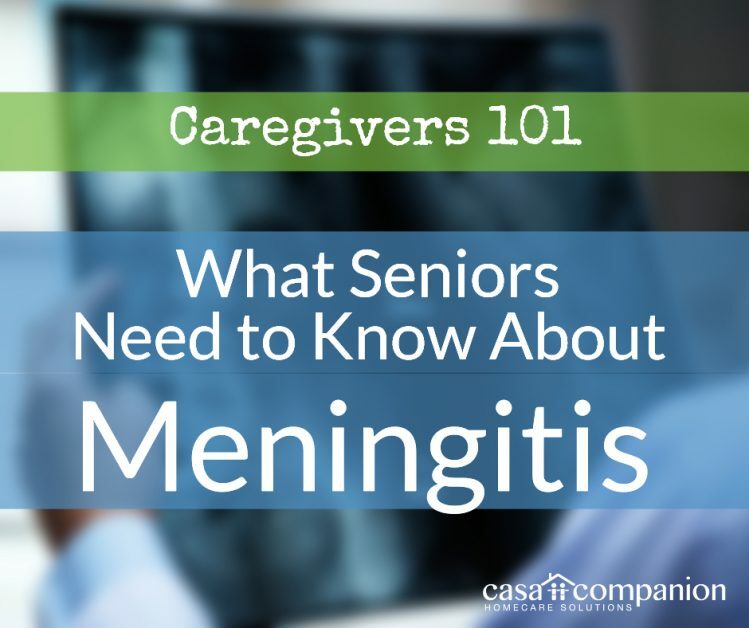 If you’re providing in home care in San Diego to a senior, there are several conditions that make seniors vulnerable to bacterial meningitis. They include chronic nose and ear infections, sickle cell disease, diabetes or a missing spleen. Seniors are also at risk after a bout of pneumococcal pneumonia, a head injury or kidney failure. Since pneumococcus is a frequent cause of meningitis, the pneumococcal vaccine is suggested for those age 65 and older with other risk factors. Even when meningitis is cured with medication or clears up on its own, it can leave permanent damage in its wake. If it’s not fatal, it can cause hearing loss, brain damage, memory, learning or mobility issues, seizures, and kidney failure. Home care companions for seniors who are fighting illnesses caused by the implicated bacteria need to watch very carefully for any signs of meningitis’ symptoms. The elderly in home care or living independently are susceptible to developing bacterial meningitis for lifestyle reasons. They may spend more time around people who are sick, encounter potentially contaminated food, or suffer from the chronic conditions that can open the door to meningitis. They often spend time in group settings with other people with the same risk factors. And they often don’t recognize their symptoms in the early stages, because they are already ill, or don’t assume their discomfort or pain requires immediate attention. If you’re receiving or providing home care in San Diego, you can take preventative steps like avoiding sources of bacterial infections and treating symptoms like vomiting, neck pain, fever and confusion very seriously.